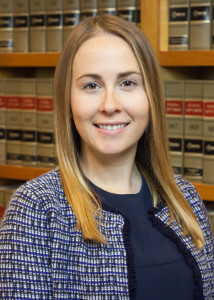 Alexandra E. Faia is an associate at Herman, Herman and Katz, LLC. Ms. Faia attended Louisiana State University in Baton Rouge, Louisiana, where she graduated with a Bachelor of Humanities and Social Sciences In Political Science. While attending L.S.U., Ms. Faia worked as a page for the Louisiana State House of Representatives for the 2010 regular session. Upon graduation, Ms. Faia worked for a national legal support firm which specialized in document and pleading preparation as well as medical records retrieval. In the Fall of 2012, Ms. Faia entered Loyola University of New Orleans, College of Law from which she received her Juris Doctorate in May of 2015. While in law school, Ms. Faia received the Academic Excellence Award for receiving the highest grade in her Health Law I class. Ms. Faia became a candidate for the Loyola Journal of Public Interest Law and ultimately became a member of the editorial board and was chosen as the Articles Editor of the Journal. Her student comment, “Politics, Prisons and Pointing Fingers: Issues Remaining after Orleans Parish Prison’s Consent Decree, ” was chosen for publication in the journal and appeared in the sixteenth edition of the Loyola Public Interest Law Journal. Prior to joining HH&K as an associate, Ms. Faia worked at the firm as a law clerk from May of 2013 until passing the Louisiana State Bar Exam in October of 2015.